Thanks to the inspiration from the (not so good) fried rice at P.F. Chang’s the other night I decided to quickly throw together a homemade version the next day. It took (what felt like) all of five minutes to make and turned out really tasty. It made me feel once again disappointed that we sat around for almost two hours waiting for a similar, more expensive, yet tasteless dish the other night. I just sautéed some leftover (cooked) brown rice with a little onion, carrot, frozen peas, egg, soy sauce, a dash of toasted sesame oil, and sprinkle of dried ginger. It was so easy and good…although I can’t speak for my 3-year-old because some days she just seems to be getting pickier and pickier! She ate a few of the grapes on the side and then just sort of picked at the rice. I think I scared her off with the carrots, but what can I say…I was not in the mood to offer her any other alternatives that day so what she got is what she got! This week my girls have been at their second (and final) week of summer camp. I was relieved that all of the kids were supposed to bring their own snacks and that the day would end before lunchtime. This just meant that there would be less requesting, coordinating, and preparing of special meals on my part. I would have done it anyway, but every now and then I like a break! One thing they were doing at camp though was giving all of the kids popsicles on the second day. So I brought along some of our homemade popsicles for my girls on that day, which was easy enough. Afterward the teachers said there were no issues with my kids having something different, and one of the little 3-year-olds actually asked if she could have a popsicle like my daughter’s instead of hers. It made me feel a little bad that I couldn’t manage to bring homemade popsicles for all 20 or so of the little ballerina girls. Some things just aren’t realistic though! Speaking of kids and what they will eat….I have been thinking about this a lot lately as I observe my children and other people’s children during snack/meal time. I truly believe that most children will eat the food choice that you give them (unless of course you already know it is something they don’t like). This simply means that it is up to the parent (and trust me I agree it is not an easy job) to make sure we are making the right choices in what we buy and offer our children. And we shouldn’t be giving them choices (like Pirates Booty vs. Triscuits or Goldfish vs. Grapes) instead we should only be offering them the best and most natural options if they are even given an option at all. I have two examples to back up my little theory here. 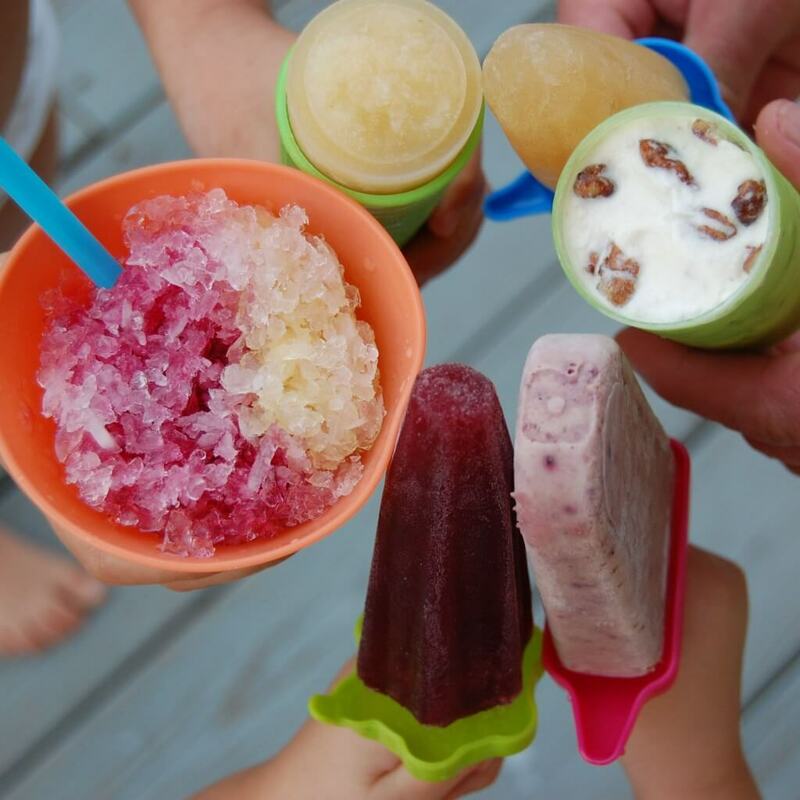 First of all, the other night after dinner, I let one of my daughter’s have a homemade freezie pop (that had frozen applesauce in it similar to the green one at the top of the picture). It was the perfect messy treat to eat outside on a hot day. Not one, not two, but three of the little friends on our street were out and saw what she was eating. They each separately indicated that they wanted “one” too (even though I am sure they didn’t know what it was). So fortunately, I happened to have exactly three extras in the freezer and was happy to divvy them up. All of the kids sucked them down with pleasure. And the only thing they were eating was all natural applesauce! Yes it was work to order the freezie pop molds and make them, but once all of that was out of the way these kids were thrilled to eat what was offered to them even when I can vouch that the very same kids usually eat pops from the grocery store. On the other hand (not that I am judging – ha ha ha), I often see people giving their kids what I consider to be “highly processed snacks” (little bags of something crunchy…you know the usual suspect). At the beginning of this year I was guilty of doing the exact same thing. But whether it is these kids or my kids (or your kids if you have them) how do you think they would respond if you instead just handed them a different crunchy alternative like some whole-wheat pretzels, a Lara Bar (or homemade granola bar), some nuts, popcorn, or Triscuits? Just a thought. We recently returned from a vacation to my in-laws’ house, where we spent a lot of time with my sister-in-law and her 2 kids (5 and 8). I don’t want to go into a lot of detail, and I swear I try not to be all judgy about other people and what they let their kids eat, but I will say that watching her let her kids eat what they wanted, whenever they wanted, was by far the most stressful part of the trip. I think if someone had handed my nephew a Triscuit instead of the Chips Ahoy cookies he ate in abundance, or a glass of water instead of the Gatorade he drank by the gallon, he would have just not eaten or drank. For some reason, this freaks out a LOT of parents I know; the thinking seems to be that it is BAD for kids to turn down food, and it’s best to get SOMETHING in them (even if it’s junk food) rather than let them miss a meal or a snack. It’s amazing to me. Eventually, I think most kids would warm up to any snack or food, especially once they realized that there were no other alternatives being offered. Given the choice, kids are not going to intentionally starve themselves. Just found your blog today, I read as much as I could now and will have to read it all in the next couple days. I think what you doing is Great!! I found a great way to make brown rice a while back on the internet. Instead of measuring the water for the rice just cook it like potatoes in a large pot of water uncovered for 35 minutes then drain the rice and put it back in the pot covered for 15 minutes for it to finish. I’ve been growing more and more food for my family and it’s great to see that some of my things are now part of our every day life. Last night I made 20 jars of wild blackberry jam and my wife and boys said “we don’t think that will last the whole year so lets pick more berries”. I totally agree. I know that some kids are just picky, and I won’t argue with that. But I hate it when I hear people say, “Oh, my kids will ONLY eat poptarts (or what have you) for breakfast.” I just want to say, “Who is the adult here? ?” No, you can’t force your kids to eat, and I think it’s very important to not turn mealtime into a struggle– but, you can calmly say, “This is what we’re having. If you’re not hungry now, the next mealtime will be in a few hours.” My 2 year old loves everything I give him. If I give him junk, yeah, he loves it– but he also loves my broccoli-kale soup, frozen blueberries, veggie quesadillas, etc. Then there’s the host of behavioral problems this junk causes in their young bodies too… Case in point: the last time we were at my husband’s brother’s house, they were getting frustrated with their 3-year-old daughter, who was jumping off the couch, screaming, throwing fits, running amok– with a store-bought chocolate chip cookie in each hand. My son was sitting in my lap, munching on an organic apple, and watching me work a crossword puzzle. Everyone was exclaiming how *calm* my son was… but all I had to do was look at their snacks to know what the answer was! Later at mealtime, while my family ate spinach salad and rice pilaf (from home), I had to bite my tongue when my brother-in-law bribed his 4-year-old son to eat ONE piece of FRIED OKRA… he told him he could have 5 twizzlers if he would eat this one deep-fried cubic inch of veggie. Where’s the logic there? Frozen applesauce pops, what a great idea! I can vouch for your comment on kids with processed snacks… I am a teacher and work w/elementary age children and the majority of snacks that I see are in convenient little packages. It makes me sad…but I do understand that w/a 2 income family cooking/baking/preparing foods and working a full time job can get quite hectic. I have been on the real food bandwagon for almost a year now and try to provide only healthy/nutritous foods for my 21 month old and myself (my husband is 1/2 way there) and there are times that I don’t get the homemade crackers made, etc… It is very time consuming. Could you share where you ordered your ice cream molds please? I bought some earlier in the summer that I’m not too happy with. Do you make your own applesauce or buy it? My kids like applesauce and I get the Motts with no sugar added, but must say I’ve not bothered to look at the ingredients…yet. I have made my own applesauce, but I most often just buy it because (if you do check the ingredients) there are quite a few organic ones out there that simply contain apples or apples and water. Hi! Just found your blog. I can’t remember what link exactly lead me here, but I was googling real food blogs or something like that and came across this. I have tried almost every way of eating and a week ago decided to start shopping at local farms and stop buying so much processed stuff. I’m loving the meats, veggies, fruits and cheeses from our local area. I’m in Northern Virginia (lived in Charlotte about 6 years ago). With two teenage boys (and their friends) to feed it is difficult. My oldest is having a sleepover and they were none to happy with my homemade, whole wheat crust pizza. My son would have be fine if it were just a family dinner – but with his two buddies he was not too happy. My husband ended up running to the store to buy them wings. I hope to sign on up for the 10 day pledge after my husband goes on his business trip next week. (He’s going to Manilla and it’s stressful enough traveling so far from home w/o having to worry about food too). Meanwhile, I’ll let my boys enjoy what’s left of the processed stuff in our pantry and start figuring out what to do the next time I have a basement full of hungry teenage boys :)! As a mother of preschoolers (one being a rising kindergartner) I have to say I have no idea what it would be like to try to transition teenagers! I am hoping since we started early it will make those years of eating easier, but of course you can’t go back in time. One thought is – do you think it would make an impact if you sat down with your son and really explained to him what is wrong with processed foods and refined ingredients like white flour (in the pizza)? Again, I don’t have a teenager, but I am wondering if he might start to care a little about his health especially if you explain to him that it might help him live longer and help his mom and dad live longer too (which of course he would care about!). Of course peer pressure from his friends could be a whole other blog, but just a thought! Here is a list of reasons that might help provide some talking points in case you want to try it: https://www.100daysofrealfood.com/10-reasons-to-cut-out-processed-food/ And good luck with your 10 day pledge! Later comer to the party, but I have a teenager. My son is now almost 18. He, too, at first was “what’s the big deal” and “it’s not that bad”. Until I made him watch Food, Inc. I had him read at least one of Joel Salatin’s books and part of In Defense of Food (not to mention that whenever I came across a particularly interesting part, I said “you guys gotta here this..” and read it outloud). Now, he still likes his junk food, but at least understands what the issues are, can discuss the matter intelligently, and he cooperates when necessary. The nice part about teens is that they have enough developed intelligence and understanding to (usually) really get it for themselves rather than it just being “Mommy said so”. For anyone who might be interested “Lara” Type Bars are super easy to make at home and much less expensive than buying in the store. If you do a search for “Homeade Lara Bars” you will come up with lots of different recipes! i love your blog and what you’re doing! we have been vegetarian for about 5 years now, and with that change also came a higher consciousness concerning processed foods. then we found out that many my “food” allergies are not actually the food itself, but the processing that gets done to the foods! grocery shopping has gotten easier than it was at first, there was a learning curve. i generally stick to the things i know, but when i am trying something new, i need to read the label for ingredients. i look for 4 things: high fructose corn syrup, food coloring (focusing on red 40), nuts (an actual food allergy), and things i cannot pronounce or picture what plant it came from. if any of these are on the label, its a no-go for us! we also dont eat any fast food at all. in the last 5 years, my general allergies as well as overall health have improved, my husband’s reflux has practically disappeared, and i have actually gained weight (i was unhealthily skinny and had difficulty keeping good weight on). it’s a lot of work right now because of the extreme difference to what you were doing before, but after your 100 days are up and you are “allowed” to have other things, you and your family will probably find you dont want those things anymore and it will be second nature for you to reach for the natural foods! I read the article in the n&o with great interest. My family has followed the feingold diet for three years. It is an all-natural way of eating, no artificial ingredients. Check it out at feingold.org. My daughter was off of ADD medication after 8 days and within five weeks her lungs had healed and she did not need asthma medication. It seems to me feingold might be easier than your 100 day diet, but still bring you the health benefits you are looking for. Kudos to you for feeding your family healthy! Thank you for your comment! I had never compared notes with anyone else about diet being a cure for asthma (although we did see a study about the correlation online) so it is really great to get some confirmation that it was not just a coincidence. Good for you guys! That is an interesting website…I checked it out. Thanks again for sharing! We used to make homemade pops from time to time just for fun… but we stopped buying the plastic wrapped and sugar filled pops and started making our own popsicles back in February. Once again… the flavor possibilities are endless… and kids dig being creative and coming up with their own flavors. Have you ever made chocomole pops? I have not, but would love the recipe! Yum! 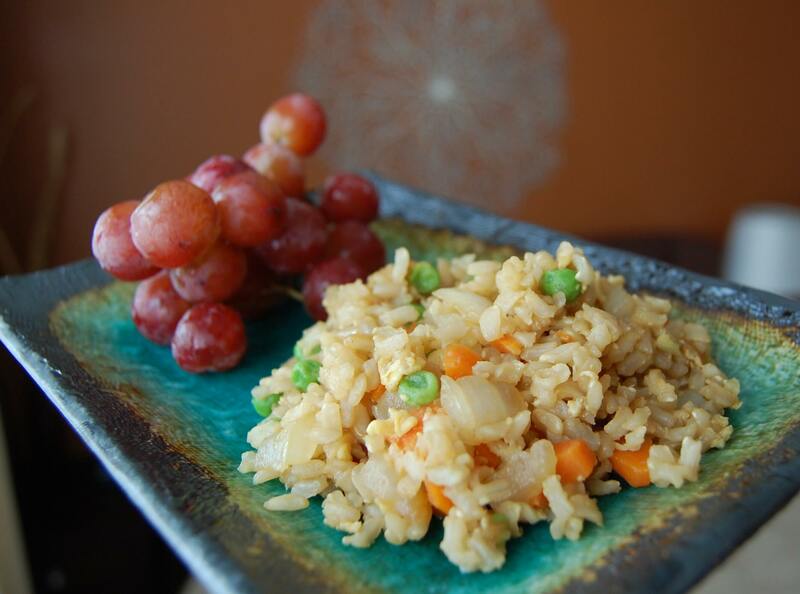 That fried rice looks relish! That is so sad to hear. And I couldn’t agree with you more…I don’t think too many of the good eaters can credit their habits solely to “luck”. I happen to have one fabulous eater and one picky eater and with my picky daughter there is no question that it can be hard work for me to get healthy food into her. But you just have to keep trying different (healthy) things until you find something that they will eat willingly. I hope things can change for the better at some point for your niece! Gosh, it’s just a miracle that anyone without an extra $350 a month to spend at upscale health food stores and a holier-than-though blog ever manages to feed their families healthy, local, whole foods at all! Oh wait…except for decent cooks with common sense. Do they not have cookbooks up in that ivory tower? Thank you for taking the time to leave a comment. In order to adjust our food budget we had to make some important decisions about our priorities. For example, we do not have cable TV and the car that I drive is 11 years old. I know there has to be a way to eat whole foods and spend less money doing it, but since I completely changed the way I food shop (from coupon clipping for all of the big brand processed foods) only six months ago I am still trying to figure out the best way to do this on a budget. It sounds like you must be very experienced on being thrifty and eating healthy at the same time so please do share any advice you might have to help me (and others) with this! What kind and appropriate response to this comment…I have to give you so much credit=)…great job, keep up the wonderful work! love the blog and the encouragement it brings! I have a question on the sugar. If sugar beets are grown locally and the plant that makes the sugar is local and it can be bought locally can that sugar be used for the whole food challenge? My husband and I agreed that this would be okay as long as you are making the dishes yourself and using it sparingly (just like we try to do with honey and maple syrup)! I love what you and your family are doing! I whole-heartedly believe that if you expose children to healthy food choices from a young age, that’s what they will go for (or they at least won’t be as likely to fight it). Kudos for your efforts and perserverance, especially with two young children. I aspire to raise my (future) kids the same way! A friend of mine saw your article in the Charlotte Observer and now we both love reading about your journey!!! I wrote a post about your challenge on my blog today; organicondime.blogspot.com…Thank you so much for making people aware of the benefits of whole foods! Welcome to the site!! I saw your post and appreciate so many others helping to spread the word about this important topic. Thank you! I am not sure how I found your blog, but I look forward to reading it and the recipes, suggestions and photos are wonderful. I just found your blog and I’m sooooo excited! I was really influenced by Michael Pollan too, and I also have two small children(3 and 8 months). Since reading In Defense of Food I’ve been slowly changing how we eat too, and I love it! My husband doesn’t always, but we reserve “fake food” for special occasions :) It’s great to see how awesome you’re doing and to be inspired. Thank you!